Sunday Photo; Great Unification Buddha – Wake Up and Laugh! Well, finally a Buddha that isn’t a Mireuk Buddha! This is none other than the Great Unification Medicine Buddha of Donghwa Temple, in Daegu. Standing at 33m (108 feet, by chance…), locals claim that it is the largest in the world. Though, I’m not sure how many other “Great Unification Medicine Buddhas” there are to compete with, I think they refer to other free-standing statues. I could imagine that it is the largest Medicine Buddha anywhere. Gazing up from beneath, the physical aspect of its greatness is obvious, but there is also another reason for this title. As you may have surmized from its name, prayers are offered here for the reunification of the Korean peninsula. Inside the body of the Great Buddha are two bone shards of Shakyamuni’s, presented as gifts from the government of Myanmar. you couldn’t have made a better choice for today’s Sunday photo, Joseph. may this Buddha not only be the largest but indeed the greatest Unification Medicine Buddha in the world! That is an interesting synchronism! I hope you don’t mind, Chong Go Sunim shared with me the story you told him about getting the papers for your doctor. It was nice to hear about something I wrote actually manifesting in the world! thank you! and yes that was great! i immediately knew i’d be successful when i saw the Avalokiteshvara. thank you so much!! 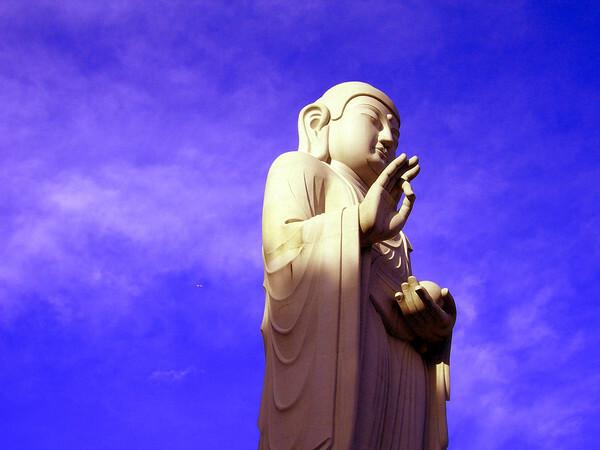 Yeah… it is a great photo with the blue sky, and the sun shining on the head of Buddha. Very fitting. Stunning. I love the clouds like mists of merit rising from his body. Great work, as always. The sky looks fluorescent. Ah, the “become one” Buddha!